Catalonia and the Spanish State have experienced exceptional events in the weeks prior to and after 1 October 2017 (1-O), the day in which the Catalan government invited the Catalan electorate to participate in a referendum on self-determination which had been suspended by the Constitutional Court at the behest of the Spanish Government. The political and social landscape has also affected the capacity and freedom of journalists and the media to carry out their jobs. 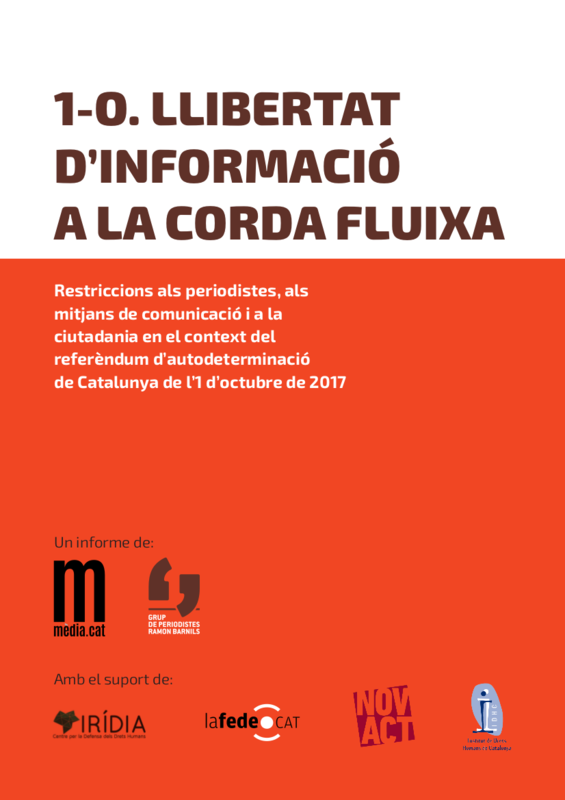 In response to this, Mèdia.cat, The Critical Media Observatory of the Ramon Barnils Journalists’ Group, has decided to create a report using the data from the Censorship Map. 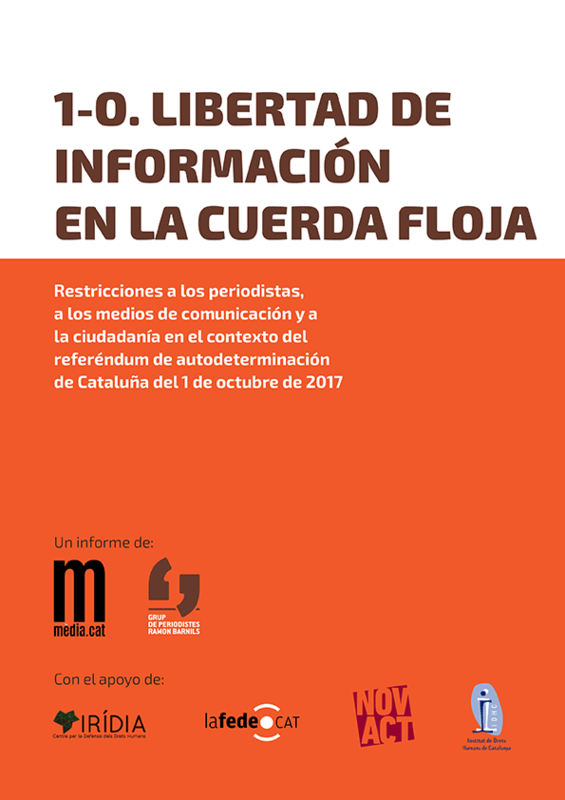 The map, starting from 2015, is designed to record in real time, occurrences and situations that impede the work of journalists or which restrict the freedom of expression or information of the public in the Catalan-speaking territories (this report also includes events that occurred in other territories but related to 1 October). Inspired by the ambitious European project Mapping Media Freedom by Index on Censorship, the Map has seen a substantial increase in activity during the months of September and October 2017: in this period, it saw more than a hundred cases related to the 1-O referendum. The cases range from aggression, threats or intimidation of journalists to complaints from professionals as to the censorship imposed on their working practices, and charges brought against journalists and media outlets. It also includes instances of restrictions on the freedoms of expression or information of the public with regard to their social or political participation. 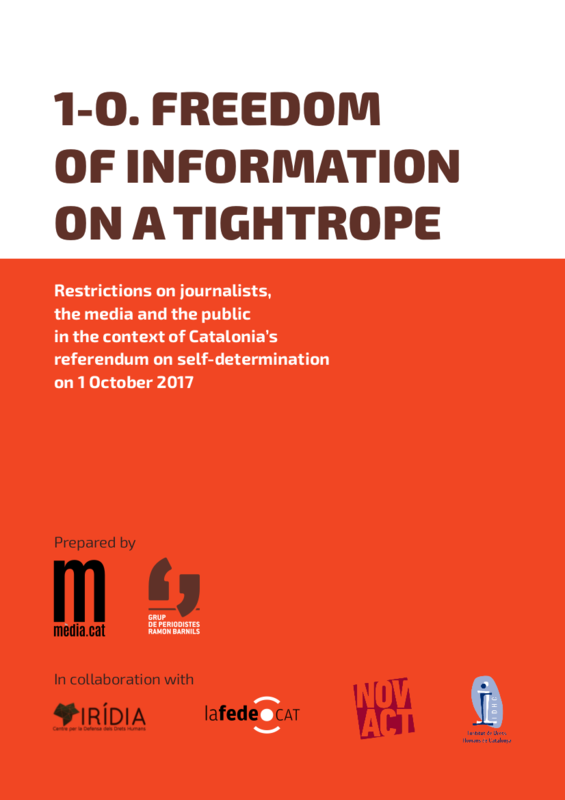 By means of the report, which systematizes and documents the hundreds of cases recorded on the Censorship Map, the Ramon Barnils Journalists’ Group wishes to explore the efforts of various authorities in Spain to prevent 1-O and how the situation surrounding these events may be inhibiting journalistic work and restricting the freedom of expression and information of journalists and of the general public. The report aims to raise awareness among the public as to these cases, denounce the possible violation of rights and ensure that they are guaranteed in the future. With this in mind, the Barnils Group will send the report to organisations that work to defend the freedom of information and expression at the national and international level.